Talks offer by Prime Minister Sharif has caused a significant rift in the Pakistani Taliban leadership. While Punjabi Taliban's leader Asmatullah Muawiya has welcomed the offer, leaders of the Pashtun Taliban have rejected it. The split has become more serious with the Pashtun Taliban's decision to remove Muawiya from his position as the leader of the Punjabi Taliban. "The Taliban decision making body met under Commander Hakimullah Mehsud and decided that Asmatullah Muawiya has no relation with the TTP," Shahidullah Shahid, spokesman for the Hakimullah Mehsud-led Tehrik-i-Taliban Pakistan (TTP), told news agency AFP. In response, Muawiya has told The Associated Press that the Taliban shura had no authority to remove him because the Punjabi Taliban is a separate group. He said his group has its own decision-making body to decide leadership and other matters. This split among the Taliban leadership should be seen by the Nawaz Sharif government as an opportunity to further divide and eventually defeat the various terrorist groups operating under the banner of the Tehrik-i-Taliban Pakistan (TTP). As a first step of this divide-and-conquer strategy, Pakistani government should proceed with identifying numerous TTP factions who are ready to negotiate and begin talking with each of them separately. Instead of making concessions, the government should prolong these separate negotiations to plant seeds of distrust and discord among the Taliban factions and let them fight and weaken each other. As a second step, the government should selectively use the Pakistani military to attack various TTP factions one at a time to reduce the TTP movement from a potent force to a mere nuisance which can be managed and ultimately made irrelevant. During this process, the government should disregard any Taliban sympathizers among politicians, military and bureaucracy who will try to influence the process in favor of the Taliban in the name of Islam to pursue their own selfish agendas. Such a strategy will require deep thinking, persistence, good negotiating skills and selective use of decisive military force to end the scourge of terrorism from Pakistan's national landscape. It will also require broad public support. Haq "Such a strategy will require deep thinking, persistence, good negotiating skills and selective use of decisive military force to end the scourge of terrorism from Pakistan's national landscape. It will also require broad public support." That is the thing, Nawaz lacks all these things. F: "This is what ISI is doing, if someone's haven't realized yet... "
Haven't heard of ISI having peace talks with the TTP. In any event, it's the Nawaz Sharif government which needs to do it and do it as a strategy to divide and defeat the TTP. Don't forget the fact that PML-N was already in some sort of an understanding with TTP during the last government. This was evidenced by some statements of Shahbaz Sharif and the fact that a) Punjab was saved of TTP attacks and b) TTP did not obstruct the election campaigns of PML-N and PTI in the recent elections while by their own statements they threatened PPP, ANP and MQM to stay away. So PML-N already has some TTP factions to revert to for talks but the strategy of TTP will surely be not to negotiate as long as they're freely operating with no hindrance from the state of Pakistan. Thus divisions appearing can be for public consumption so that negotiations are stalled, rather than real ones. You should also ponder on the scenario that with PML-N and PTI/Jamaat governments in place, Pakistan may already be in taliban control. Miranshah, Pakistan: A spokesman for the Pakistani Taliban on Saturday denied media reports that the government was holding peace talks with the insurgent group. Shahidullah Shahid, main spokesman for the Tehreek-e-Taliban Pakistan (TTP) said that no contacts had been made between the group and any government official. “I categorically deny the holding of peace talks on any level between the Taliban and Pakistani government,” Shahid said from an undisclosed location. “No contacts have even been made between us, nor have we received any offer to initiate peace talks” Shahid added. Pakistan’s respected English language daily DAWN quoted Information Minister Pervez Rashid as saying the government was in secret talks with the TTP. “Unofficial talks between the government side and Taliban are in progress,” Rashid told the paper. Rashid said the government’s main objective was to restore peace and it would do everything possible to achieve that. “We have to rid the country of the menace of terrorism for which all options would be utilised,” Rashid was quoted as saying. BBC Urdu, quoting an unnamed senior government official and a Taliban commander, also reported the beginning of peace talks. “It is complete propaganda, the government must make it public if it has any proof of any such talks,” Shahid said. The reports of peace talks emerged almost two weeks after Prime Minister Nawaz Sharif made an offer to the extremists in his first televised address to the nation since taking office after winning elections in May. Previous peace deals have rapidly unravelled, and were criticised by the US and at home for allowing militants space to regroup before launching new waves of attacks. The Taliban last Saturday removed a key commander for welcoming Sharif’s call for dialogue. Ismatullah Muaweea, the head of the TTP in Punjab province, had said the prime minister had shown maturity. First, this war is not like an interstate war. While everyone knows that, or thinks he does, most do not understand the implications of that fact. This war has no front and no rear. It is being fought among the people. The enemy is elusive, flexible, ruthless and adept at countering and neutralising the state’s superior force. Corollary: there are no defined boundaries of this war, and there is no line separating the zones of war and peace. Fighting it is more difficult because force has to be used, for the most part, deftly rather than overwhelmingly. Second, the groups fighting the state act both as insurgents and terrorists. That requires using different techniques and operating in different environments. The two prongs complement each other. While the state has largely degraded these groups’ capacity in the badlands through military operations, it has been less successful in countering terrorism in urban centres. This point is important because when we talk about jaw-jawing with the militants, the argument generally is that the state has been unable to put them down. That is only partially true. But to degrade their capability more fully, the state will have to put them in a nutcracker, taking them on effectively in both the periphery and in the urban centres. It hasn’t done that so far — at least not effectively. Third, even in the periphery, while force has been used to dominate physical space, the other two corners of the triangle, social-psychological and fiscal-economic, have not been addressed with the same vigour. The army is not trained to do that and the civil administration hasn’t really caught on to the changed ecosystem of the tribal areas.. Finally, war is communication. 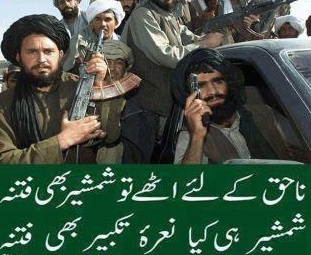 The Taliban are addressing the Pakistanis. The state has to realise that it, too, is supposed to do that. The Taliban narrative is clear, concise and precise. It exploits the fault lines within. The state’s narrative is confused and timid. The problem with the irresolute All-Party Conference is not that the politicos want to talk but that they have communicated weakness. This might come across as a no-brainer to anyone with a brain, but they don’t seem to get it. A bungled attempt by the Afghan government to cultivate a shadowy alliance with Islamist militants escalated into the latest flash point in the troubled relationship between Afghanistan and the United States, according to new accounts by officials from both countries.The disrupted plan involved Afghan intelligence trying to work with the Pakistan Taliban, allies of Al Qaeda, in order to find a trump card in a baroque regional power game that is likely to intensify after the American withdrawal next year, the officials said. And what started the hard feelings was that the Americans caught them red-handed. ISLAMABAD, Pakistan—Fighting within the ranks of the Pakistani Taliban has stalled peace talks with the government as the militants' focus turns inward, militant commanders and officials said Friday. A turf war between rival factions of the group, known formally as Tehreek-e-Taliban Pakistan, has claimed between 25 and 30 lives since Sunday in the country's tribal areas, say commanders of the militant group. Prime Minister Nawaz Sharif in September launched the talks, controversial among Pakistanis because the Pakistani Taliban has claimed the killing of thousands of civilians and security personnel, but they have yielded little progress after weeks. The initiative delayed the planned launch of a Pakistani army operation against the militants. Among the dead in recent days are three prominent commanders, militants said. The fighting, which has taken place close to the Afghan border in both North and South Waziristan, has included gunbattles and the firing of rockets and grenades. Some analysts said the government would prefer to deal with a united Taliban but others said the discord should be welcomed. "There's nothing better for Pakistan than these terrorists killing each other," said Mehmood Shah, an analyst based in Peshawar who was formerly a senior security official for the tribal areas.